Gum laced with caffeine! 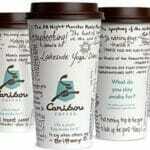 It can be a great way to get a pick-me-up without having the inconvenience of guzzling down an energy drink or a coffee. Sometimes drinking just isn’t an option, so a good caffeine gum can be the answer to get you through boring lectures/meetings or even keep you energetic for those special times with your significant other with fresh breath to boot. Update: The caffeinated gum market was hit hard a few years ago by the FDA, which sent out a warning to caffeinated food product manufacturers. Many pulled out of the market including gum giant Wrigley’s. However, not all caffeinated gum is created equal and some deliver more kick for your money, so we put together this handy caffeine gum guide so you can make informed decisions when choosing that perfect energy gum. When flavor, caffeine, and price come together in the right combination, you have found a winning gum that should wake you up as you chew. Update: We’ve indicated the gums discontinued by using a Strikethrough. The most common complaint people have about caffeinated energy gum is the flavor. Most of the ones I’ve tried lose flavor pretty quickly and what’s left isn’t that appealing. Caffeine and other energy ingredients tend to have a bitter taste, so as soon as the sweetener is dissolved, what remains can be unpleasant to the palate. Some are better than others and the mint varieties last a bit longer than the fruit flavored energy chewing gums. 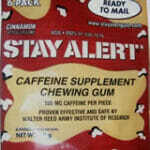 The other danger with caffeine gum is ingesting too much caffeine. The varieties that list more than 50mg per piece could be potentially dangerous for those with low caffeine tolerance of if they get into the hands of children. Caffeine energy gum can be a great alternative to energy drinks, but chew the gum responsibly and don’t expect the caffeinated gum to last as long as your standard chewing gum. It will be interesting to see if this energy product market segment will last in the USA. 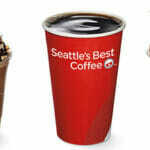 Seattle’s Best Beverage Caffeine Guide Seattle's Best Coffee Beverage caffeine amounts including, espresso, latte, mocha, frozen, iced, and flavored drinks. 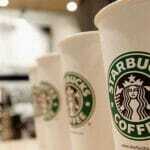 How does it compare to other cafes?